Para estas Fiestas Navideñas hemos diseñado este cuello doble. Es muy bonito y elegante. We have designed this double cowl for this Christmas: It is beautiful and elegant. VUELTA INICIAL: 176 cad. múltiplo de 16 puntos. VUELTA 1: Tejer 2 cad. de subida y 175 p.m. hasta terminar la cad inicial. Seguir tejiendo sobre los primeros p.m. Poner un marcador que nos indique las vueltas que llevamos. Tejer un total de 30 vueltas en espiral y cerrar con 1 p.c. Rematar el hilo de inicio y final del cuello. FOUNDATION ROW : 176 ch multiple of 16 stitches. ROW 1: 2 ch to start the row and 175 hdc until the row is finished. Keep working. Put a marker at the beginning of the row to be able to count the rows. Make a total of 30 rows working continuously: Finish off with 1 sl st.
Hemos tejido una cenefa de 6 vueltas en la parte superior del cuello y otra en la parte inferior. El diseño es una bonita combinación ondas para las VUELTA 1 a 5 y 1 concha, 1 onda, 1 flor de 5 pétalos, 1 onda y 1 concha, para la VUELTA 6. We have made a border of 6 rows in the top part of the cowl and another border of 6 at the bottom. The design is a combination of waves for rows 1 to 5 and 1 shell, 1 wave, 1 flower of 5 petals, 1 wave and 1 shell for row 6. En cualquier punto del cuello para la cenefa inferior o después del p.c. del último p.m. para la cenefa superior, comenzamos la VUELTA 1 de la cenefa. VUELTA 1: 1 cad. de subida, 3 cad., saltar 2 p.m. y tejer 1 p.b. Repetir 3 c.a.d. p.b. hasta completar el cuello y cerrar con 1 p.a. en la c.a.d. de subida de la vuelta. VUELTA 2: Tejer 4 cad. y 1 p.b. en el centro de la onda de la vuelta anterior. Introduciendo la aguja dentro de la c.a.d. central de la onda. Repetir 4 cad. p.b. hasta completar el cuello y cerrar con 1 cad y 1 p.a. en la primera cad. de la vuelta. VUELTA 3: Tejer 5 cad. y 1 p.b. en el centro de la onda de la vuelta anterior. Sin Introducir la aguja dentro de la cad. central de la onda. Repetir 5 cad. p.b. hasta completar el cuello y cerrar con 1 cad y 1 p.a. en la primera cad. de la vuelta. VUELTAS 4 y 5: Tejer 5 cad. y 1 p.b. en el centro de la onda de la vuelta anterior. Introduciendo la aguja dentro de la cad. central de la onda. Repetir 5 cad. p.b. hasta completar el cuello y cerrar con 1 cad y 1 p.a. en la primera c.a.d. de la vuelta. In any stitch of the cowl for the bottom border or after the sl st for the top border, start ROW 1. ROW 1: 1 ch to start the row, 3 ch, skip 2 hdc and make 1 sc. Repeat 3 ch, sc until finish the row. Finish off with 1 dc in the ch we made to stat the row. ROW 2: 4 ch and 1 sc in the centre of the wave of the previous row. Introduce the hook inside the central ch of the wave. Repeat 4 ch, sc. until complete the cowl. Finish off with 1 ch and 1 dc in the first ch of the row. ROW 3: 5 ch and 1 sc in the centre of the wave of the previous row. Without introducing the hook inside the the central ch of the wave. Repeat 5 ch, 1 sc until complete the cowl and finish off with 1 ch and dc in the first ch of the row. ROWS 4 and 5: 5 ch and 1 sc in the centre of the wave of the previous row. Introducing the hook inside the central ch of the wave. Repeat 5 ch, sc until complete the cowl and finish off with 1 ch and 1 dc in the first ch of the row. VUELTA 6: 1 cad. de subida, 1 concha de 4 p.a. en la primera cad. de la vuelta anterior, 1 p.b. en el centro de la onda de la vuelta anterior. Introduciendo la aguja dentro de la cad. central de la onda. Onda de 5 cad. 1 p.b. en el centro de la onda, flor de 5 pétalos y 1 p.b. en centro de la onda de la vuelta anterior. Onda de 5 cad. y p.b. en el centro de la siguiente onda. Concha de 4 p.a. en el p.b. de la onda de la vuelta anterior. Repetir concha de 4 p.a., onda de 5 cad., flor de 5 pétalos, onda de 5 cad. y concha de 4 p.a. Cerrar con 1 p.c. a la cad. de subida. ROW 6: 1 ch to start the row, 1 shell of 4 dc in the first ch of the previous row, 1 sc. in the centre of the wave of the previous row. Introducing the hook inside the central ch of the wave. Wave of 5 ch, 1 sc in the centre of the wave, flower of 5 petals and 1 sc in centre of the wave of the previous row. Wave of 5 ch and sc in the centre of the following wave. Shell of 4 dc in the sc of the wave of the previous row. Repeat shell of 4 dc, wave of 5 ch, flower of 5 petals, wave of 5 ch and shell of 4 dc. Finish off with sl st.
Para tejer la flor hemos ampliado este detalle. PÉTALO 1: Piña de 3 cad. de subida y 2 p.a. juntos. PÉTALOS 2, 3 Y 4: 3 cad. de subida, 1 p.a y 3 cad. de bajada. cerrar con p.c. en la parte superior del centro de la piña del PÉTALO 1. PÉTALO 5: Piña de 3 cad. de subida y 2 p.a. juntos. PETAL 1: ps of 3 ch to start the row and 2 dc together. PETALS 2, 3 AND 4: 3 ch to start the row, 1 dc and 3 ch to go down. Finish off with sl st on the top part of the of the centre of the p of petal 1. PETAL 5: ps of 3 ch and y 2 dc together. Unir la flor a la cenefa con 1 p.b. en el centro de la onda de la vuelta anterior. Esperamos que os haya gustado tanto como a nosotras tejer este elegante cuello doble. Join the flower to the border with 1 sc in the centre of the wave of the previous row. We hope you enjoy as much as we did making this elegant cowl. 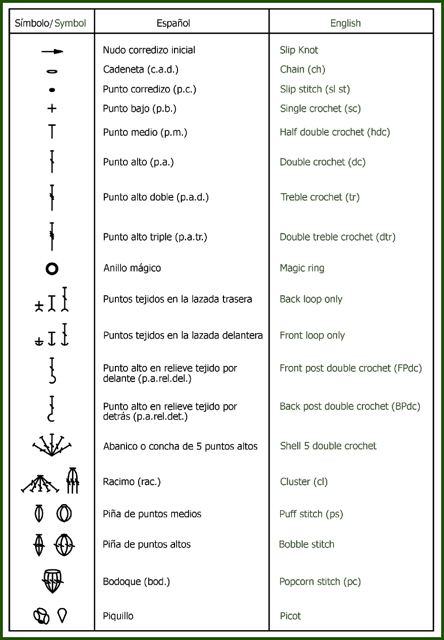 Esta entrada se publicó en CROCHET y está etiquetada con bufanda, cowl, Crochet cowl, Cuello, Cuello de ganchillo, cuello doble, cuello elegante, Double cowl en 14 diciembre, 2015 por Mondays crochet. Qué chulo queda. Veo el croquis de la flor y las fotos de cómo se va haciendo, y me veo tardando días para llevarlo a cabo y teniendo que usar superglue, jejeje. Besitos! Teníamos esas flores metidas en la cabeza y las hemos dejado caer en el cuello. Estamos muy orgullosas del resultado! Oscar, creo que te están entrando muchas ganas de aprender. Te veo leyendo con una manta en las rodillas tejida por ti.